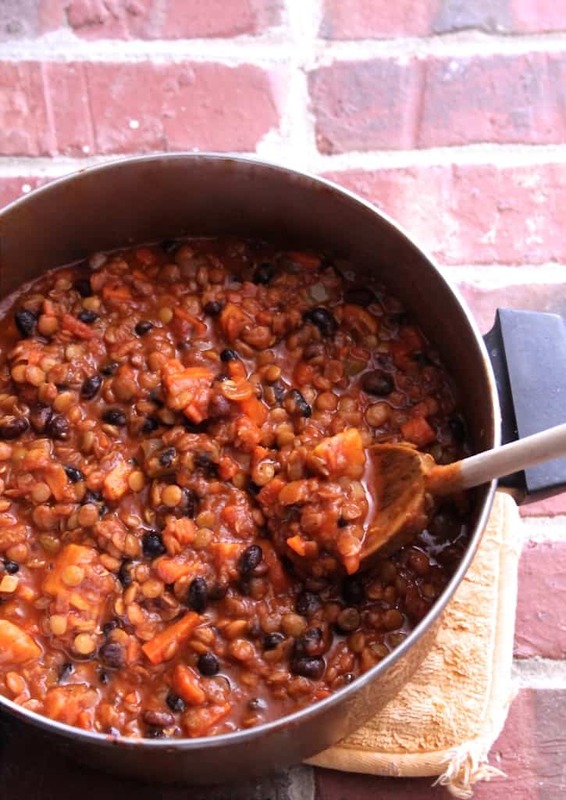 This hearty, filling lentil vegetarian chili features sweet potatoes and black beans! It’s the perfect cozy meal to curl up with on cold or rainy days. If there’s one thing I’ve learned over my years of cooking, baking, and well, eating, it’s that you can’t always judge a dish by its cover. Sometimes, the not-so-pretty foods are the most delicious. 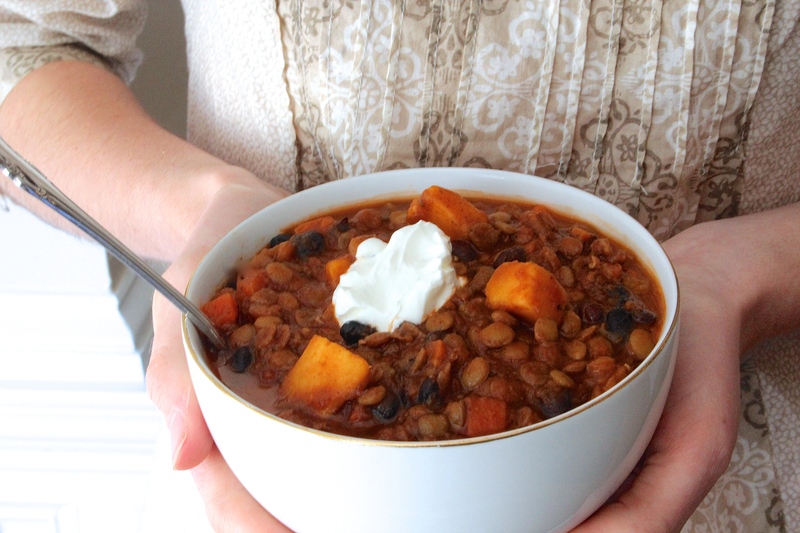 Case in point: this sweet potato, black bean, & lentil vegetarian chili. Over the weekend, veggie chili sounded like the perfect thing for the cool weather we’ve been having in North Carolina. I spotted a bag of dried green lentils hanging out in the pantry, which I love using because a) they’re really affordable and b) they have a lot of protein. I also decided to incorporate sweet potatoes, too, because when can you go wrong with sweet potatoes? And black beans were a natural addition since black beans + sweet potatoes are a match made in heaven. Although I’m not a vegetarian, I love experimenting with meatless recipes, and the resulting chili was the best thing I’ve eaten in weeks! It was so hearty and filling. Even my meat-loving dad had a bowl of this sweet potato chili the next day for lunch and declared it to be a success. And check it out: for a huge bowl of vegetarian goodness, you’re looking at 360 calories, 22 grams of protein, and 12 grams of fiber. That’s pretty awesome! 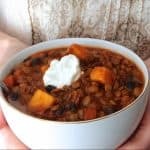 Not to mention, lentils and black beans are both packed with iron and sweet potatoes are loaded with Vitamin A.
I already can’t wait to make this lentil vegetarian chili again! 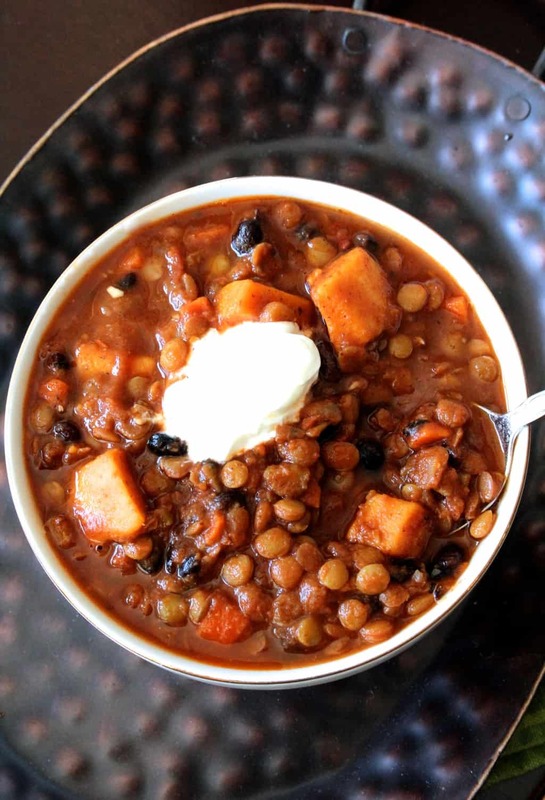 Sweet potato chili is healthy comfort food at its finest. 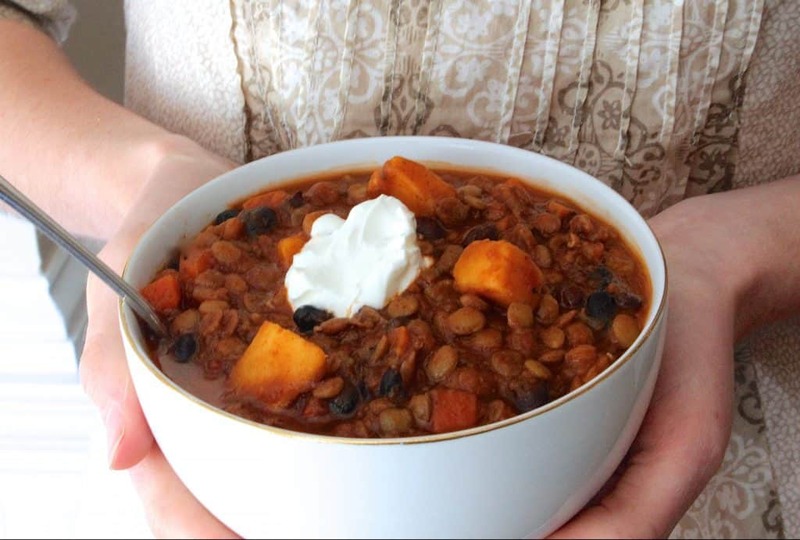 If you try this sweet potato, black bean, & lentil veggie chili, feel free to let me know in a comment or take a picture and tag me @livbane on Instagram– I’d love to see! In a large pot over medium heat, add the olive oil, chopped onion, and garlic. Sauté for about 5 minutes. Add the remaining ingredients (vegetable broth, water, marinara or tomato sauce, tomato paste, lentils, and carrots). Then, add the spices (chili powder, paprika, cumin, cayenne, and salt). Turn the heat up to high, bringing the broth to a boil. Once it boils, reduce the heat to medium low, cover and simmer for 10 minutes. After 10 minutes, add cubed sweet potato and black beans and let chili simmer on medium-low heat for 40-50 more minutes or until the lentils are tender. Add extra water or broth to thin, if needed, toward the end. Top chili with sour cream, avocado slices, and/or freshly grated cheese, if desired. Enjoy! Hungry for more? Check out some of my other favorite soups and stews! I actually prefer vegetarian chillis. I think they are much heartier and therefore more filling. Hi Liv! Don’t think we have ever met, but it is lovely to meet you, and I am SO glad you are joining us today 🙂 This sounds lovely, I love the sweet potato and black bean combo! They go so well together. I look forward to supporting you in your future journey. 🙂 Have a wonderful day, and I hope you join us again next (and every!) week! Thanks, Tina! Looking forward to linking up again in the future 🙂 Hope you have a great day! This looks great! I tried to make something like this last week in the crockpot actually and it came out so soupy – I’m going to have to try something like this next. While a sweet potato black bean soup is good all I wanted was chili! When you want a thick, hearty chili, I agree– a thin soup just doesn’t compare! I was just about to ask Liv if she thinks this recipe would work in a crockpot, and what adjustments one would need to make. So now I’m asking both of you! Hi Ingrid, I think this recipe would work great in a crockpot! For ease of cooking, I’d toss all of the ingredients in the crockpot except for the black beans and cook on low for 6-7 hours or high for 3-4 hours (depending on your crockpot’s settings. I’d add the black beans just before serving so they don’t turn into mush, and I’d chop the sweet potatoes into large pieces if adding at the very beginning with the lentils so they don’t get overcooked. For your first time experimenting with making it in the crockpot, I’d definitely check it a little before you expect it to be ready and then note the settings it takes with your specific crockpot. Hope that helps!! This looks SO.GOOD! Sweet potatoes and lentils are two of my favorite foods (sorry black beans 🙂 ) so this is a winner for me! I don’t count calories either but I like having nutritional info to estimate how filling it is by how much protein or fat it has. It helps me plan out my other meals and workouts. I don’t eat ground meat so this chili is perfect for me! It sounds amazing! Yum! Looks so hearty and PERFECT! I think this not only looks delicious but the recipe sounds wonderful too! I love black bean/sweet potato combo! This looks so hearty and delicious. Love lentils anytime! yum! This looks great. At one of my favorite vegan restaurants, Gracias Madre in LA they make sweet potato flautas that are amazing!!! Is it terrible that I just had to Google what flatuas are? Haha! But I found recipes and pictures of sweet potato flatuas and they look so good! I think the best vegetarian meal I’ve ever had probably would have to be at this random monetary in Hong Kong where monks made all the food. I seriously still dream about it to this day, 6 years later! Haha that’s too funny! Maybe you can try to recreate the meal from the monastery? Perfect meatless Monday meal when it is cold out! Vegetarian chili is one of my favorite comfort foods. My favorite vegetarian dish, that would be a hard one, as a former vegan, gone vegetarian, now more “flexitarian” I eat mostly vegetarian/vegan still and I have so many favorites! that looks great I love sweet potato and black beans together. Thanks for linking up w us today for Meatless Monday! Oh this looks so delicious!! I’d love to chow down on a bowl of this for lunch right now! Sweet potatoes are fantastic! MY favorite way to use them lately is as an ice pack for my foot (I have a frozen bag) and it works GREAT! I just have to say, I am vegan and have never eaten soy nuggets hahaha, there are so many great options you really don’t need dead animals to feel satisfied. Just my opinion. Chili looks great! I think you’re right– lentils are so underrated! Agreed about the not so pretty dishes being the ones that actually do often taste good! I’m sorry to hear that it turned out too spicy for you, Shelby! I’ll add a note to the recipe to start with less chili powder and taste it before adding more. If you’d like, you can add extra water/broth, marinara sauce, or even a can of chopped or diced tomatoes to help cut the heat now (or top with some Greek yogurt/sour cream). Thanks for your feedback! It is better to be a day late than a dollar short! I really do not know what that means in its entirety. I mentioned it because of the late part:) You posted this recipe quite a while back and today I finally tried it (I tried the winter veggie recipe late too and loved it…and discovered an intense love of brussel sprouts and have never looked back!). Back to this recipe. I tried this for meatless Monday as my usual meatless meal is a Kashi pizza, which can get dull. This recipe was perfect! The lentils give it that “meat” texture and you don’t miss the ground meat at all. The sweet potato gives it a sweet kick that offsets the hot spices. The prep work was also pretty easy. Great work! Love this!! Converting this to a dog food recipe and linking to your recipe! This looks DELICIOUS! As a vegetarian I’m always looking to try new recipes so I can’t wait to try this. Think it could be made in a crockpot? Hi Dayna! I think this recipe could definitely be made in a crockpot. I haven’t tried it so I’m not sure about exact cooking times, but I bet 5-6 hours on high or 7-8 hours on low would do the trick to cook the lentils and sweet potatoes. When I’m testing a new slow cooker recipe, I like doing it on a day that I’ll be around so I can start checking for doneness on the earlier side of the time range I’m estimating, if that makes sense! Sounds awesome! Hope you have some great hikes this winter, Sean! I love this recipe and I’ve sort of modeled it twice now when making my own chili. Thank you for posting this, but I just have to say (and I hope this does not come across as rude, I apologize if it does!) that in your fear of putting off meat-eaters, you may be putting off vegans and plant-based eaters by writing that you didn’t want to include the word vegan because you’d hate to scare people off. You are making an assumption of all things with the word “vegan” as scary. Vegan can also mean healthy (often, not always, of course). I was just a bit put off by that little section. And some of us love soy nuggets! Lol I know plenty of meat eaters who enjoy them. I hope you understand my point about you basically demeaning the word “vegan.” There are many of us and veganism is only growing. I am aware people think it has an image problem, but please don’t add to the painting of it in a bad light. Thanks for the recipe! Sounds delish! Are the lentils soaked before-hand or are they canned lentils? Thanks! Hi Kristen! I use dried lentils and don’t soak them beforehand. They actually cook pretty quickly! Thanks! Could you substitute a can or two of diced tomato (or something else) instead of Marinara Sauce (marinara isn’t very common where I’m from)? Hi Kirsten! You could absolutely use canned tomatoes! I’d recommend using crushed tomatoes rather than diced, as those are most similar to the texture of marinara sauce! This is in the crockpot right now! Can’t wait to try! Awesome, I hope you love it!!! Hi, i love this recipe.I only think it is too spicy, even though you give the option of less chili or peper. I think there is a mistake with table spoons of chili, it should say tea spoon.